GALION — The hardest thing about high school sports is having to replace a crop of seniors who shined brightly in their final season. Galion High School and head coach Phil Jackson will have to do just that as they begin their 2018 run in the Mid-Ohio Athletic Conference and beyond. Last year’s group for the blue and orange finished second in the now defunct MOAC Red Division, behind state-ranked Jonathan Alder. In fact, Galion was the only squad to beat the Pioneers within the conference a season ago. Gone from that group are Mac Spears, Garrett Kuns, Will Donahue, Ryan Talbott and Devin Baughn. Spears is now up in Tiffin pitching for Heidelberg afer a senior season where he was named first-team all-conference. Joining him on that first-team was pitcher and shortstop Kuns, who led the MOAC Red in hits, going 36/83 at the dish in 2017. Donahue and Talbott were both members of the second-team all-conference squad last year. But Jackson, joined by a coaching staff that includes Mike O’Leary, Bart Cass, Brian Vredenburgh, Neil Schaffner, Josh Riggle, Phil Harris and Dan Gorbett will field a team that looks to continue on in the Tigers’ winning ways. Jackson is entering his sixth year as skipper of the Tigers and boasts a 81-50 record, including 18-9 last season (8-4 in the conference). Barnhart joined the above-mentioned Tigers with conference honors last season, earning an honorable mention nod. With the strengths comes the weaknesses for Galion, aside from having to replace and regroup after the graduation of key pieces to a championship puzzle. Wilson Frankhouse (IF/OF/P), Matt McMullen (IF/OF/P/C), Spencer Keller (IF/P), Carter Keinath (P/1B/OF), Troy Manring (IF/P/C) and Jackson Staton (OF/P) will all be in competition for some varsity time on the diamond in their first year at the high school level. Other players to be on the look out for suiting up in Tiger blue and orange are: seniors Mitch Dyer, Ethan Pigg and Chase Castline (OF), juniors Ryan Utz, Cameron Payne and Kaleb Harsh (IF/P). Galion still keeps the same goals as every year in mind; league, sectional and district titles. Clear Fork made it all the way to Huntington Park and the state Final Four last season and the Barons are looking to bounce back after a sixth-place finish in the Red Division in 2017 at 4-18 overall and 3-8 within the league. 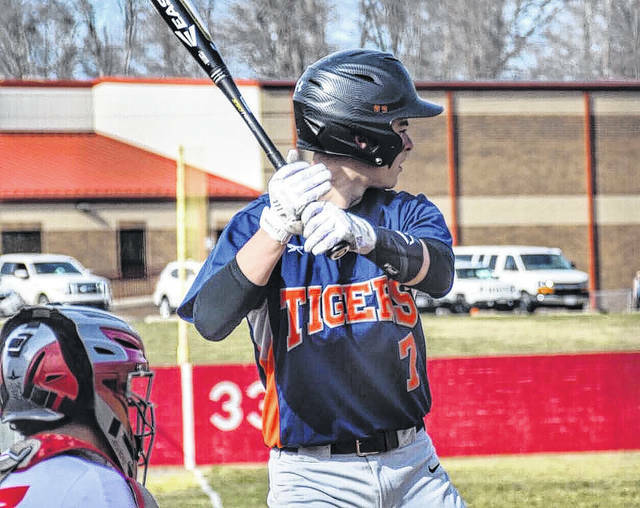 The Tigers’ regular season — weather pending — is set to start Saturday, March 24 with a home doubleheader against the Shelby Whippets. Galion will begin the MOAC portion of its schedule on Tuesday, March 27 at Pleasant, before hosting the Spartans the following day. 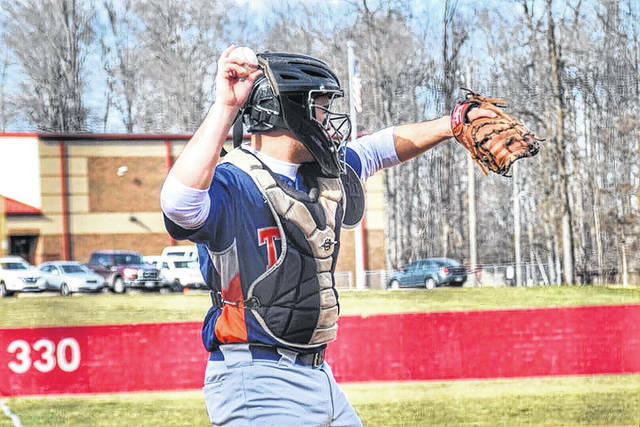 Galion’s senior catcher Aaron Barnhart brings a wealth of experience to a young Tigers squad ahead of the 2018 baseball season. Barnhart was an all-conference honorable mention last season for Phil Jackson’s team. Mitch Dyer (pictured, at-bat) will suit up for the orange and blue for one last season in 2018. Dyer and the rest of the Tigers look to make some noise on diamonds around Ohio and in the new-look MOAC this spring.